The Board of the Mid Michigan Photography Club (MMPC) had developed a survey seeking your input and feedback to make MMPC a better organization. The survey is being sent to current and former members by email. We encourage you to reply to the survey. The survey period will close Monday April 22, 2019. Please join the Mid Michigan Photography Club at its April meeting. We will meet at the Turner Dodge House 100 E North St, Lansing, MI 48906 for a hands on session using objects in the house. Bring your camera, lighting, a tripod, and a macro lens if you have one. We will gather at 6:30 p.m. on Wednesday, April 3, 2019. All are welcome. Because the Turner Dodge House requests donations, MMPC is asking members to contribute $5, payable to Turner Dodge, for the cost of this meeting. The April 2019 MMPC meeting is scheduled for Wednesday, April 3, 2019, at 6:30 p.m. The meeting will be held at the Turner Dodge House, 100 E. North Street, Lansing. The Turner Dodge House features architecture and artifacts that are often photographed. Because the Turner Dodge House requests donations, MMPC is asking members to contribute $5, payable to Turner Dodge, for the cost of this meeting. Bring your camera and equipment. More information about the Turner Dodge House is at https://www.lansingmi.gov/938/Turner-Dodge-House. The March 2019 MMPC meeting is scheduled for Wednesday, March 6, 2019, at 6:30 p.m. The meeting will be held at First Presbyterian Church, 510 W Ottawa St, Lansing, MI. The theme for the March Big Cookie competition, March 2019, is Trains. The March meeting is when we have a club member do a Pick and Share, we need a couple of volunteers for the March meeting. Please consider volunteering for the Pic and Share session. Contact any MMPC board member or email to mmpclansing@gmail.com for more information. Everyone – You are invited to the “Leslie Library Shutterbugs” on Feb 23, 12-2 pm. This is a monthly photography discussion group that meets at the Leslie Library on the 4th Saturday of each month, 12-2. This is NOT a club! There are NO dues! It is an informal gathering for people to come and talk photography, ask questions, and have some fun. This month Bill Harrison from Custom Photography will be talking about Luminar, and how it compares to Lightroom. He will give a quick overview of processing in each. This is NOT an in-depth class on either, but rather a basic introduction to post processing in them. Everyone is welcome to come. Again, there is no fee to attend. Registration is not required, but a quick message to tammy.vandermolen@sbcglobal.net would be appreciated to know how many to expect. Each year, during the last weekend in February, the Greater Lansing Orchid Society sponsors an orchid show and sale. The photographers’ hour is scheduled from 9:00 a.m. to 11:00 a.m. on Sunday, February 24, 2019.Tripods are allowed. The challenge is to avoid distracting backgrounds. The show is held in the Plant and Soil Science Conservatory on the Michigan State University campus. Information about the show is at https://www.greaterlansingorchidsociety.com/GLOSShow.html. The April 2019 MMPC meeting is scheduled for Wednesday, April 3, 2019, at 6:30 p.m. The meeting will be held at the Turner Dodge House, 100 E. North Street, Lansing. The Turner Dodge House features architecture and artifacts that are often photographed. Because the Turner Dodge House charges, MMPC is asking members to contribute $5 for the cost of this meeting. Bring your camera and equipment. More information about the Turner Dodge House is at https://www.lansingmi.gov/938/Turner-Dodge-House. The annual MMPC Photo Clinic is scheduled for Wednesday, January 9, 2019 at 6:00 p.m. MMPC members are invited to attend. This event is designed to attract new membership in MMPC. Please note the start time and encourage attendance by all that may be interested. Bring your camera and macro lens (if you have one) to the February MMPC meeting on Wednesday, February 6, 2019 at 6:30 p.m. at First Presbyterian Church, 510 W Ottawa St, Lansing, MI. Woody from the Camera Shop will setup tabletop photography stations for us to shoot, including a water drop station. This should be a fun and productive meeting. We will also select the Monthly Challenge drawing winner for 2018 at the February meeting. Congratulations to RJ Eberbach, Judge’s Choice and People’s Choice, for his December winning entry with the theme of Man It’s Cold Outside.” That image is now in the gallery at http://mmphotoclub.com/competitionbig-cookie/. The theme for the next Big Cookie competition, March 2019, is Trains. Please consider sharing your photos during the Pic and Share. Contact any MMPC board member or email to mmpclansing@gmail.com for more information. MMPC Clinic – January 9, 2019 6:00 p.m. Please share this announcement with all that may be interested. We need your help to get a good turnout. This is a reminder that MMPC is sponsoring a field trip to photograph the Pere Marquette steam engine operated as the “North Pole Express.” We plan to meet at 8:30AM in the Burger King parking lot I-69 and M-52. That will give us enough time to get in place before the train arrives on its way north. All are welcome to join us. The annual MMPC Holiday Dinner is scheduled for Wednesday, December 5, 2018 at 6:00 p.m. Main dishes including vegetables and salad will be provided. You may bring a desert to pass if you choose. Please respond to the event on Facebook so that we can get a count of members planning to participate. A slideshow of MMPC members’ photos from the 2018 MMPC Photo Challenge will be running during the meeting. Big Cookie theme will be “Man It’s Cold Outside.” Be prepared to participate in a group photo. We will meet at First Presbyterian Church, 510 W Ottawa St, Lansing, MI. Please join us. The annual MMPC Gallery Show is now in place at Riverview Church – Holt Venue. The show will be in place through January 27, 2019. Please feel free to stop by Riverview Church, 3585 E Willoughby Rd, Holt, MI to view the work of MMPC members. Take-Down is scheduled for Monday, January 28, 2019 5:00 – 6:00 p.m. 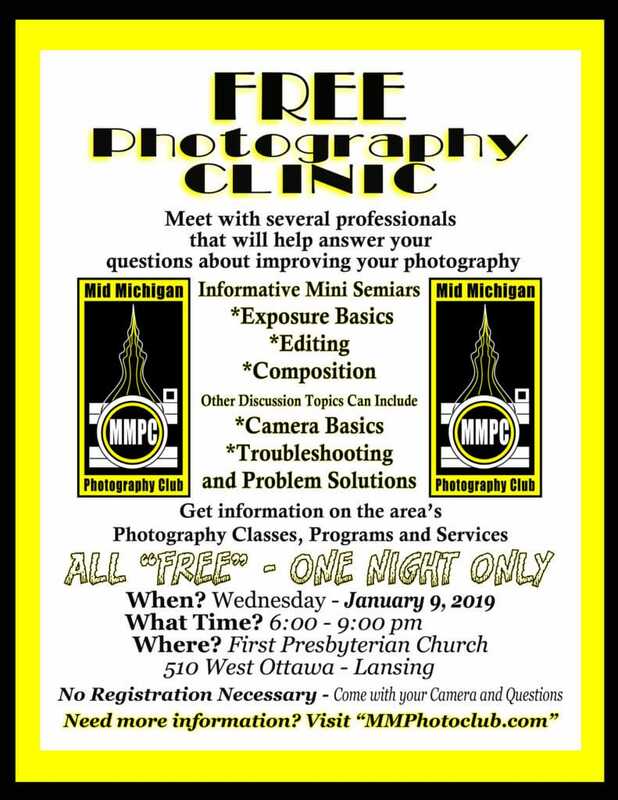 The annual MMPC Photo Clinic is scheduled for Wednesday, January 9, 2019 at 6:00 p.m. MMPC members are invited to attend. This event is designed to attract new membership in MMPC. The November 2018 meeting of the Mid-Michigan Photography Club is scheduled for 6:30 p.m. on Wednesday, November 7, 2018 at the First Presbyterian Church, 510 W Ottawa St, Lansing, MI. Former MMPC President Penny Eisfelder will present on Alaska. MMPC member Carlos Castillo recently purchased a Canon mirrorless camera. Carlos will share the features of his new camera with those that arrive before the meeting, at 6:15 p.m. The November 2018 meeting of the Mid-Michigan Photography Club is scheduled for 6:30 p.m. on Wednesday, November 7, 2018 at the First Presbyterian Church, 510 W Ottawa St, Lansing, MI. Former MMPC President Penny Eisfelder will present on Alaska. As a follow-up to the previous Lightroom Workshop, The Mid Michigan Photography Club is pleased to sponsor an interactive workshop to help members to use Lightroom to improve their images. This presentation will be a follow-up on the first workshop and will provide opportunity for participants to work on their own images with guidance from the presenter. John Stine will again lead the workshop on Saturday, November 3, 2018 the First Presbyterian Church, 510 W Ottawa St, Lansing, MI from 8:00 a.m. until noon. Registration costs will be $20 for MMPC members and $40 for non-members. The registration form for the event is available at http://mmphotoclub.com/wp-content/uploads/2018/09/Lightroom-Registration-Form-102.pdf and can be mailed with payment to MMPC, 10727 Keefer Hwy, Portland, MI 48875 or the registration form can be submitted at the October MMPC meeting. Attendance will be limited to the first 30 registrants. As a reminder, MMPC Board meetings are listed on the MMPC calendar at http://mmphotoclub.com/calendar/. The annual MMPC Holiday Dinner is scheduled for Wednesday, December 5, 2018 at 6:00 p.m. All MMPC members are encouraged to attend and to bring a dish to pass. The club will provide dinner.